Leather Palm Work Glove With Knit Wrist - Mens. Clute pattern Knit Wrist leather palm is made from heavy side split cowhide. 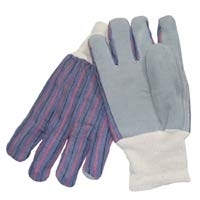 Suggested for applications needing the abrasion resistance of leather and the breathability of cotton. Sold by the Dozen.